The Most Perfect Mother’s Day Breakfast Tray! When I became a mom I had no preconceived notions about Mother’s Day. Before Mother’s Day my dad would take my sister and I out to buy a card and either a potted plant or a bouquet of flowers. On Mother’s Day morning my sister and I would hand my mother her card and flowers. We usually took a family day trip to a local historic sightseeing spot or museum. I grew up in England, America, and Italy. We celebrated Mother’s Day according to where we were living. In America, the weather was nice enough in May for a day trip, but March in England is often rainy and miserable. I don’t recall when Mother’s Day is celebrated in Italy, but in the United Kingdom Mothering Sunday is celebrated mid-March. I did a quick search and Italians celebrate Mother’s Day on the second Sunday in May…same as Americans. Celebrating Mother’s Day may be a recent event for Italians as I don’t remember it when I lived in Milan as a teen. My kids make me feel VERY special on Mother’s Day. They always have. From the scribbles of my oldest on her first Mother’s Day card to me when she was a few months old to the hand print paintings from my children when they were preschoolers, I love every minute of Mother’s Day. My husband will always let me sleep in…he knows how I love my sleep! My kids used to wake me at the crack of dawn but now even they let me sleep in! 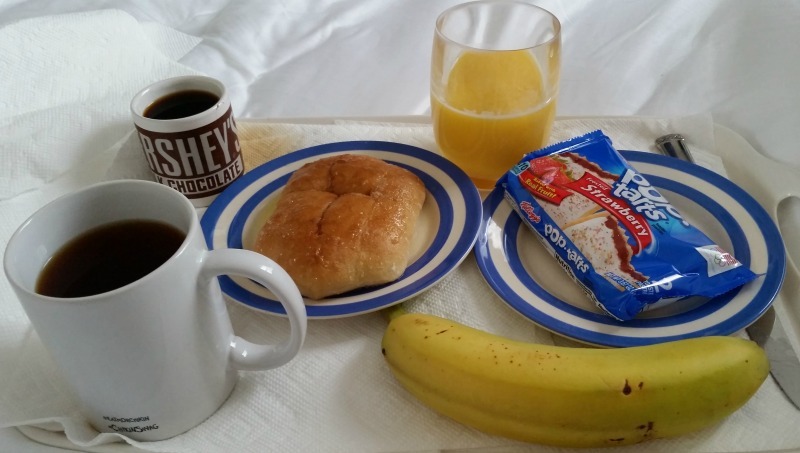 Breakfast in bed has always been a tradition on Mother’s Day and Father’s Day. I never made my mother breakfast in bed. I don’t know if my husband ever made breakfast for his parents but somehow or another my oldest started the tradition. When she was a baby, she would drink her bottle while I ate breakfast. When she was a preschooler, she made me the MOST delicious “mini” doughnuts from My Big Backyard magazine — now called Ranger Rick Jr. Later my daughters made other delicious Mother’s Day treats from American Girl magazine recipe. The last couple of years, my youngest has taken over Mother’s Day and Father’s Day breakfast in bed duties now that his sisters are snoozing-asleep-all-the-time teens. He takes his cooking duties VERY seriously. This year I received a Mother’s Day Breakfast in Bed Tray that could feed 2 if not three people! He made me a toasted torte bread dripping with butter, a banana, strawberry Pop Tarts, a teeny cup of coffee, a huge mug of tea, and orange juice. My Mother’s Day Breakfast in Bed Tray was absolutely delicious! !